Published by INFORMS/MAS Topics in Operations Research, 2001, 256 pages, ISBN #1-877640-16-6. Available to INFORMS members for $30.00 from the Book Series, "Topics in OR" [external link]. 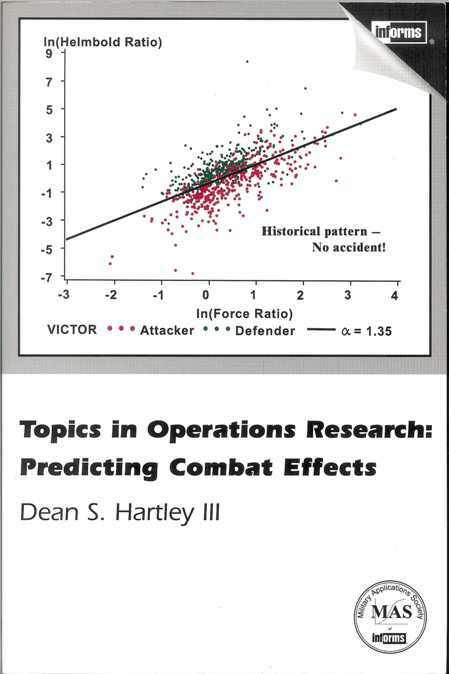 This book analyzes hundreds of historical battles to determine whether there are any consistent formulae for predicting combat effects. The results are positive and are incorporated in a spreadsheet battle model, which includes attrition, duration, advance, and victory. Attrition at the gross level is determined to follow neither the Lanchester Square Law nor the Lanchester Linear Law. Instead, attrition follows a law between the Linear Law and the Logarithmic Law. The model and all data are contained in the included CD. The figure illustrates the provocative fact of patterns in historical battles: the battles follow an upward slope. Positive ln(Force Ratio) indicates more attackers than defenders are present. The red dots show that attackers are more likely to win than defenders when the force ratio favors them. However, attackers also win when the force ratio favors the defenders. The attackers are generally victorious below the sloping midline and the defenders win above the line. The mathematics in this book is simple (not much above multiplying and dividing), most of the bulk is figures and tables, and the conclusions and caveats are summarized at the end. The model (included on the CD) runs on Lotus or Excel virtually instantaneously and only has a couple of dozen inputs.